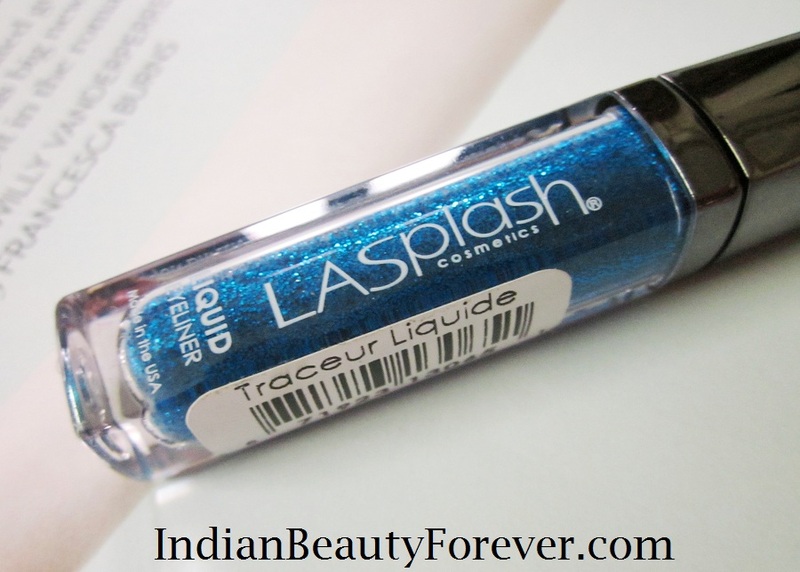 LA splash is an USA brand and it says that it’s price is 695 INR which I don’t think so may be it would be less or they would have added even the shipping charges. In that clear base, there are chunky glitters. 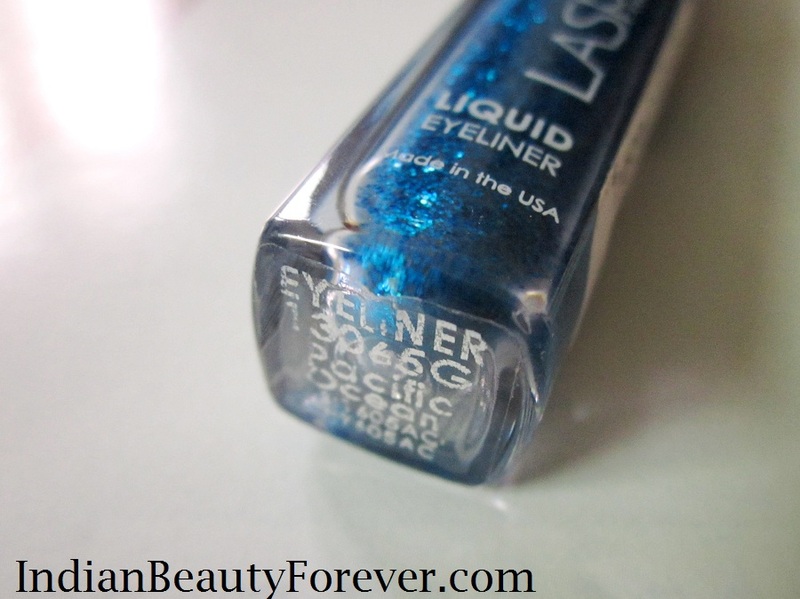 When I got it I was assuming the liner would have like very finely milled shimmer. 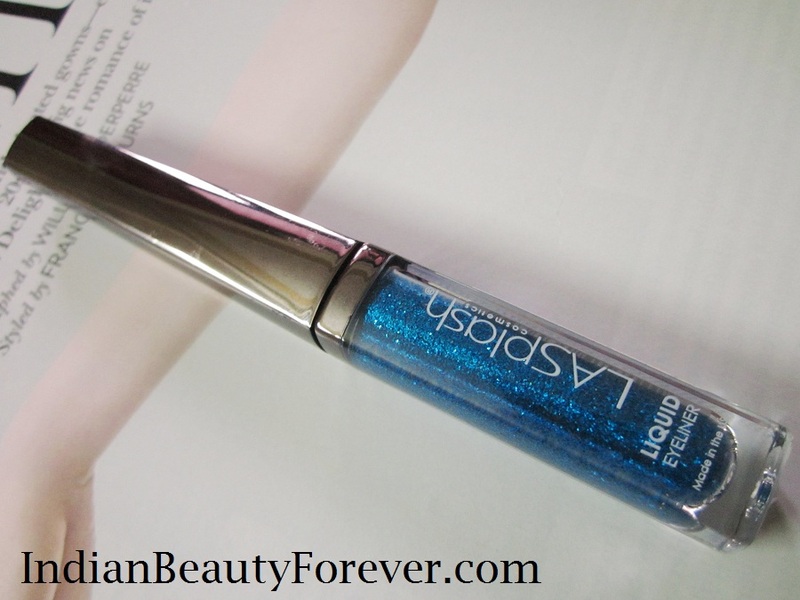 Like we see in Lakme fantasy shimmer liquid eyeliners. 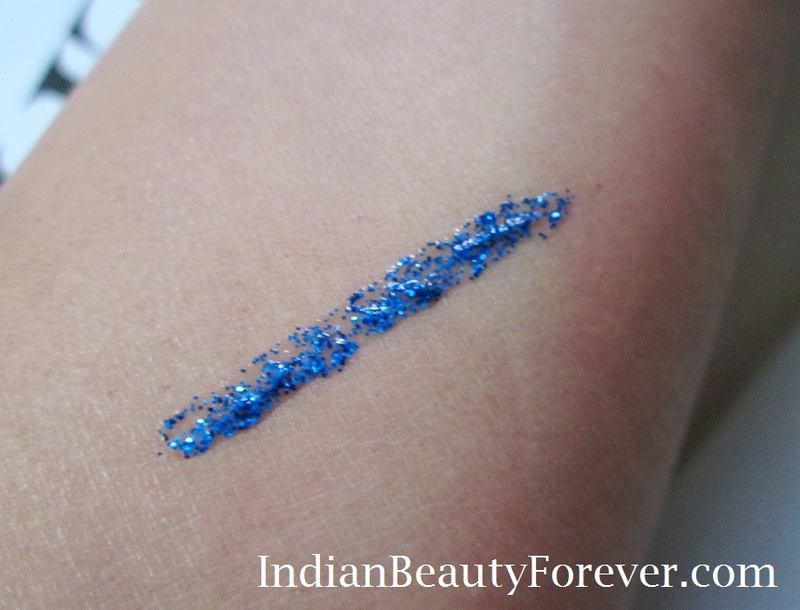 As it has chunky glitters, it gives and uneven finish that means the glitters will not be same everywhere! Using this alone is useless, as I think it’s not going to look good, but I should say that when used it over a black eyeliner or even a blue as a base it looks really great! Have a look at the picture below. But not on my eyes!! On my lids I have my Maybelline gel eyeliner only! 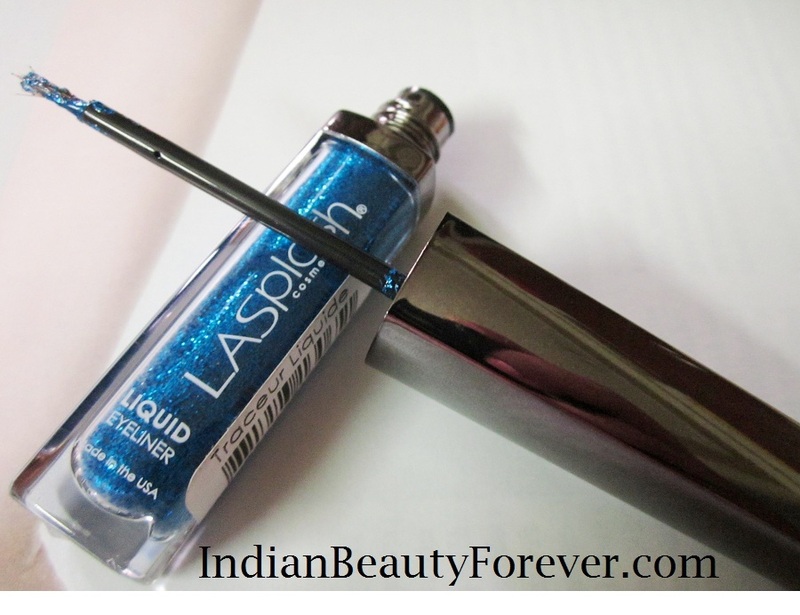 Overall, this LA Splash glitter Eyeliner in Pacific blue is an average product and there is nothing that you would spend that much on it. It takes ages to dry and expensive. Won't recommended it!! so pretty niesha and it look more beautiful on your eyes !!!!! woww over a black base it looks awesome, loved ur eotd, they r amazing , good work, keep it up! Thank you Manya! Glad you liked the look! Thank you sooo much Aayushi. :) You should try gels, they are easier to apply than liquids. Gorgeous Eyeliner Niesha... Loved the way you have layered it over! By itself it would have been very streaky...Looks great on you! Thank you so much Pearl!! :) But these glitters are like sticky so they will not get into the eyes as my eyes are sensitive too. I Even Love The Shade a Lot! Thank you Pooja! :) You got a grey black one na that was a great color, it would look fab on black base as well. Its incredible on your eyes!! Its a shame that its not up to the mark quality wise, the color is such a perfect electric blue. Loved it on your eyes. This is looking superb. Fab eye look. Everything looks pretty on you... but I know it is very difficult to pull this one off!! Aww thank you so much for the compliment Neha!! :) Honestly I am not much into such bright colors in person as well! Why is it that I love every thing you wear? You look gorgeous! :D Thank you so much Nivi!! Thanks for the compliment dear! It's actually a very pretty shade Niesha and you found the perfect solution to use a base eyeliner under it. It's looking awesome on your eyes, but I agree it's too much of an effort for that price. Thank you so much Gagan!! I will pair this with brown as well and see how it looks. I agree dear, too much efforts and it is expensive at that price. That's a wonderful eyeliner!!! I really like those blue glitters! Thank you so much Marghe!! :) I am glad you liked. Although I'm not a big fan of blue, it looks great on you! Thank you so much dear! Green looks fab on you, I saw that recent post of yours where you did green on the eyes. Thank you so much Radha!!. :) Glad you liked! Thank you Saumya! 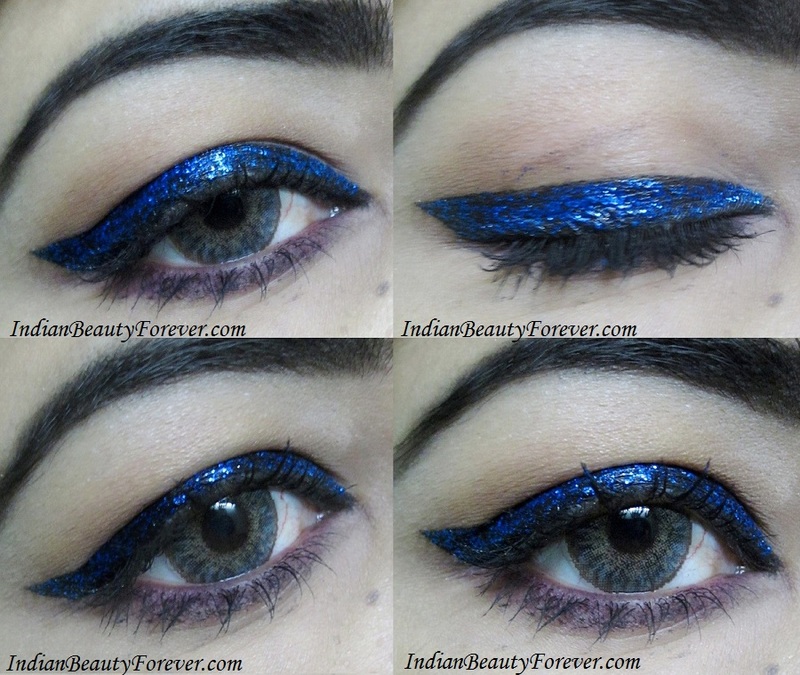 It is really good for the touch of glitters on the eyes. Consistency of the liner is so bad, but you have used it beautifully. Gorgeous EOTD. Doesn't matter what the product is, It's look great on your eyes! It's your talent how you have used this glitter eyeliner on your beautiful eyes!! It looks very pretty over the black liner. A lovely look for a night out. Thats goregous! stunning blue for a party attire. 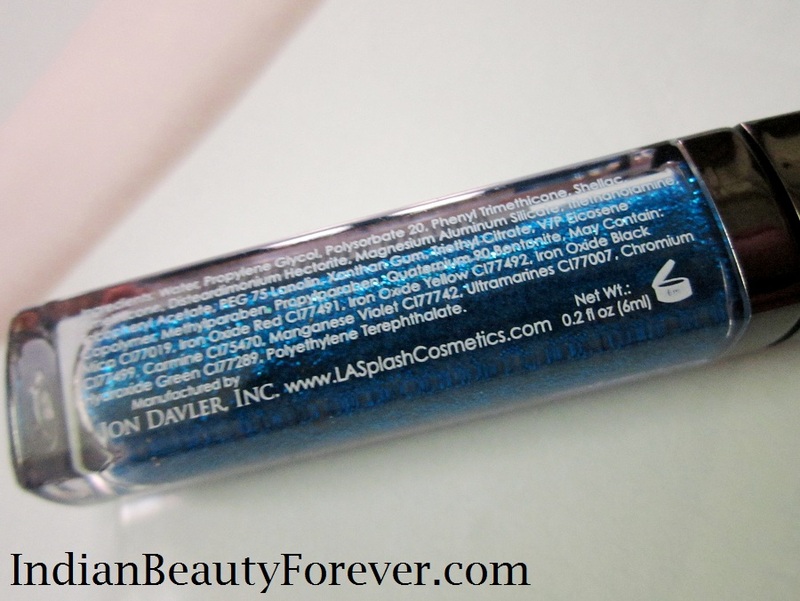 I recently posted a review on the perfect navy blue eye pencil by Colorbar. You may check the complete review of it on my blog at wordpress.